The minimal aesthetic, the laid-back vibe and all the love and geekery that’s gone behind the cocktails and (a rather impressive) modern coastal food menu, makes Mahe a winner. We dig the hospitality too — Parth, Sandeep are delightful hosts. 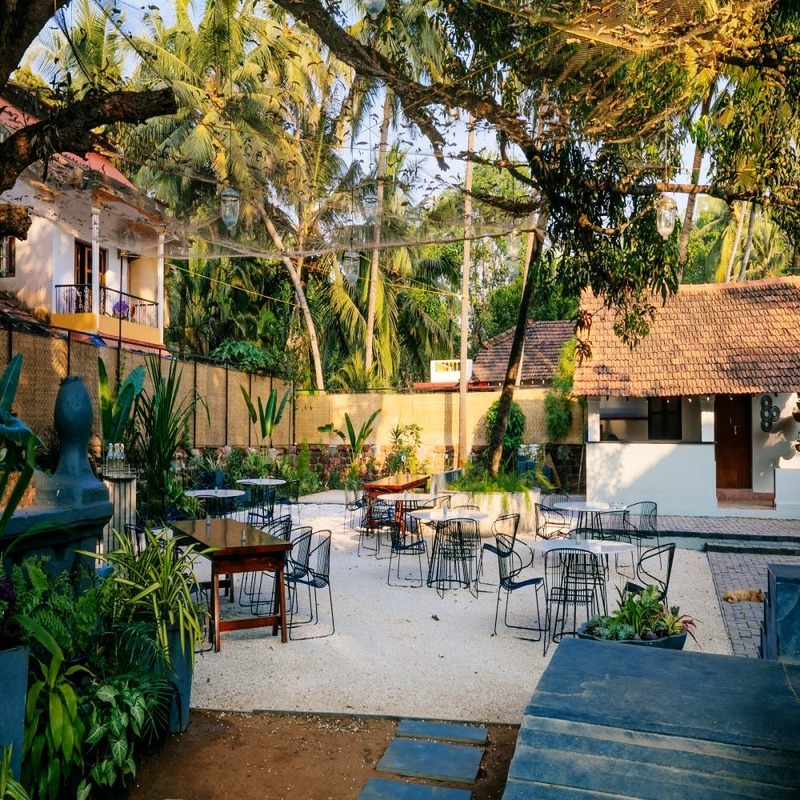 Soon as you set foot inside this gorgeous space in Anjuna, you know it’s not going to your average dinner. With a bar section, a dining area, a garden space and a store, they’ve managed to use the overwhelmingly big villa pretty well. Much as we love how Mahe looks, we have to say, it is the killer food we’re going back for. Every dish at Mahe is a nostalgia trip and a sweet reminder of how unadulterated, simple flavours can blow your mind. If chef Sandeep is around, he’ll regale you with stories surrounding each recipe and that itself makes you look at the food from a whole new perspective. We started our debauchery with Aubergine Rechaedo, a subtle but powerful rendition of a classic but with a signature twist. Paired with poi and a hung curd dip, it balanced out flavours with the precision of a German engineer. Tapioca Bravas was crunchy on the outside and fluffy like a cloud on the inside… Again a carnival of flavours and textures. The most pleasant surprise came in the form of a certain Crispy Okra With Pickles. This cold bhindi salad is something we’ve never had before and boy, were we impressed?! This fine dine is kind to vegetarians with lots of innovative options (30–40% of their menu is vegetarian) but the meat eater had a real party, to be honest. He loved the Kerala Beef Fry where the spices were spot-on and the texture was just right. Next up was Red Snapper Ceviche, again a mild coastal delight with hints of coriander oil and guava. A must-try however, is the Slow Cooked Mackerel in plum sauce. For mains, Sri Lankan Mutton Curry and Chana curry with dosas are our picks. If you’re more on the conservative side with your food choices, don’t worry, there’s a section of familiar things like moong curry, dal with drumsticks, chicken chettinad and more. To wash all this delicate fare down, head straight for their cocktails. They’ve gone all mad scientist with these and our favourites have to be Deccan Sour and Kokum Shrub. You’ll see the magic of local ingredients and offbeat combinations really come to life in these alcoholic concoctions. Oh, and please, don’t even think of leaving without saying bye to the adorable cats (Brownie and Oscar) and eating the Pradhaman Panna Cotta (this dessert cannot be described in words). For now, they’re only doing dinner (7pm onwards) and are open all days. In a few weeks, they intend on doing breakfast and we can’t wait to see eggs in coastal style or dosas with chutneys! There’s also a small section inside the restaurant that’s going to have a speakeasy vibe. We're waiting for it to open soon.